In our efforts to get control over the world at the micron scale we often find out that we have so much to learn from living organisms that have been surviving and evolving in it for billions of years. 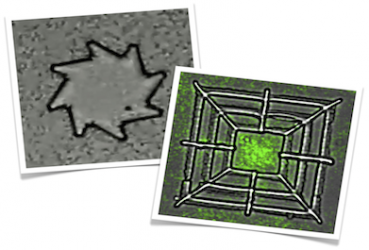 Bacteria are a beautiful example of micron-sized, self-propelled micro-machines. These unicellular organisms are not just capable of growing and reproducing, but they can swim very efficiently, sense the environment, and look for food, all packaged in a body measuring a few microns. Some of them, as E.coli, achieve propulsion in an inertialess world by spinning helical flagella a hundred times in a second by means of a rotary nano-motor which is a dream for modern nanotechnology. Being still far away from synthesizing artificial nano-motors of comparable efficiency, researchers have started to wonder about the possibility of harnessing living systems in quite the same way we’ve been doing with animals before the invention of engines. But can we conceive a totally autonomous micro-device that is powered by bacteria in a predictable way with no need for external control ? Or, in other words, can bacteria spontaneously rectify their random motions and coherently work to perform a predetermined task ? At a first sight that could seem quite a hopeless challenge. In fact, when a synthetic colloidal object is suspended in an active bath of swimming bacteria, strong fluctuating forces appear driving it along random walks that in many situations just look like "hot" Brownian motion. However, even when a steady state is reached, microscopic dynamics is usually not invariant under time-reversal. As a consequence, rectification phenomena may occur in the presence of a broken spatial symmetry. Besides posing fundamental challenges in non-equilibrium statistical physics, these rectification phenomena provide novel strategies to exploit "active matter" as the workforce in micro and nano engineered devices. In particular I will discuss how swimming bacteria can be used to actuate a micro-rotary motor or to deliver micron sized cargoes onto target sites.